Adidas Springblade: Shoes with Actual Springs Might Be a Good Idea? Adidas has another new running shoe, this one even more divergent than its Boost shoe and its new foam. It's a bunch of springs, basically, strapped to your foot. And it sort of makes a lot of sense. They also look like hell to clean. 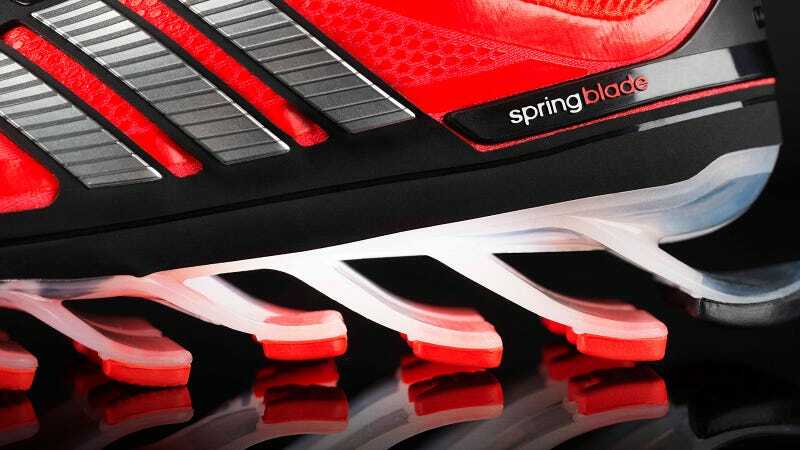 The Springblade's 16 blades are made form a propietary polymer, which has been in development for six years and is designed to be hard enough to provide the bounce-back energy return Adidas wanted, but soft enough so it doesn't just break from being brittle. Beyond style, there are a few differences between the Springblade and the Boost, despite both being part of Adidas's Energy Running umbrella. According to Steve Vincent, Adidas's head of Innovation, Boost is more for "unlimited energy"—think long runs—while the Springblade is "explosive energy" you'll feel with every step. Who would benefit most from this style of shoe? "A heel striker will probably get a little more out of it," Vincent says, "Since you're engaging all of the blades, but it will return energy for any style of runner." That's similar to our experience with the Boost, though the forward propulsion of all of the blades—as opposed to the upward bounce from foam soles—should be a bit more useful for forefoot runners. Also, the Springblades aren't really designed for trail running, and are probably best left for the road. Like Adidas's CrazyQuick basketball shoes, the Springblade has a modular midsole that allows it to give different parts of your foot different feedback. The rear blades are thicker than those at the front of the foot, and even from side to side, the thickness of the blades differs. That sounds a little worrisome for extreme heat and cold, actually, but Adidas promises the thermoplastic material holds up to the elements. You'll want to keep an eye on actual tests for this, though. Adidas says that it's even calibrated the blades to respond to the average weight of a person wearing each size shoe—so a size 10 men's shoe will have different reflexive properties than a size 7 women's. The Springblade isn't going to be out until August 1st—meaning it misses most of the summer-running season. That's unfortunate, especially since it looks so great. But we've also got plenty of reservations about how well this is going to perform, since we haven't been able to try on a pair, and the entire Springblade line is being launched with significantly less pomp than the gigantic Boost/Energy Running event earlier this year. The upper is a fairly standard treatent, with Adidas's TechFit four-way stretch snug on the foot. Robbie Fuller, Design Director of Advanced Concepts at Adidas, said the idea from the start was to keep things simple, since the blades are so striking on their own. At one point there was an idea to match lines to each blade, but that ended up camouflaging them too much. So, the basic design is simple, but with "inferno red" on black as the launch color. The material underwent a bunch of official-sounding tests, like having ballistic steel balls fired at the shoes, but the best thing Adidas said was that a bunch of people ran hundreds of miles in them and felt great and didn't get hurt. Which, of course, we'll want to test for ourselves, but that's all that really should matter here. We'll have samples in for a full review soon. The Springblade will be out on August 1st for $180.